is my great grandfather on my dad's side. David's daughter, Sarah Lilla Watt, is my grandmother. David Watt was one of eleven children born to John Watt and Jane Wilson. John Watt is listed as a sailor on David's birth record, in 1858. When David's sister, Mary, was born John Watt's occupation was listed as flax dresser. The year was 1876. David Watt's son, Burton, told the story of David's immigration. He thought David immigrated to Canada with his Uncle Wilson and five other boys, in 1874. They went to work for the Canadian Pacific Railroad. David became a train engineer. 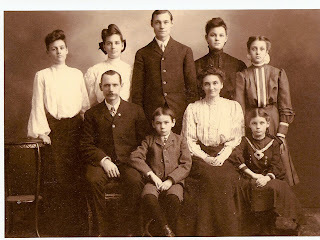 David's Uncle Wilson moved to Marquette, Michigan to take a master mechanics job on a young railroad called the Duluth, South Shore and Atlantic (DSS&A). David came with him and worked for the DSS&A railroad as an engineer. 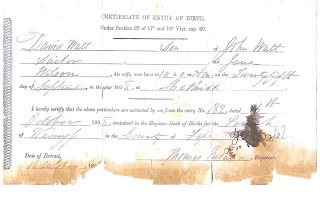 (David's census records give the date of immigration to the United States in 1879, 1880, and 1881.) His train route went from Marquette, Michigan to St. Ignace, Michigan. 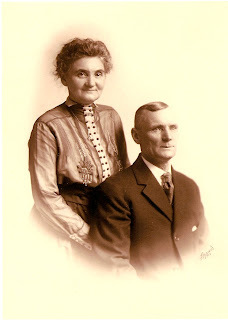 David Watt married Katherine McGee, daughter of Richard McGee and Sarah Jackson, in St. Ignace, Mackinac, Michigan. 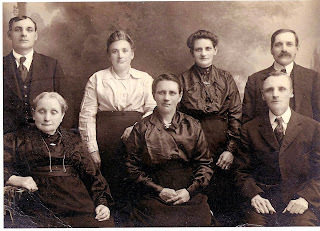 According to Michigan Marriages 1868-1925, found at pilot.familysearch.org, David Watts married Catherine McGee 16 May 1883 in St. Ignace, Mackinac, Michigan. The 1900 U.S. Federal Census has 17 as the number of years of present marriage. 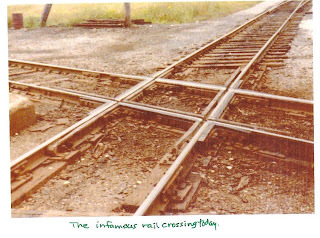 The rail crossing of the Soo Line and Duluth South Shore and Atlantic at Trout Lake Station, Michigan. Thank you to Judith Watt, Cousin Judy, for sharing the pictures on this post.